Manufactured from heavy gauge steel with seam welded joints. Folded lips add strength and rigidity. Box may be secured with a padlock hidden in recess at the front. Tamper-proof locking system protects padlock for extra security. Features industrial strength handles on each side of box for manoeuvrability. Lid features gas support strut(s) for easy opening. Model No's SSB02E and STB03E are also fitted with welded feet allowing unit to be moved by forklift. Feet have pre-drilled holes for the option of securing in one place or for easy attachment of four heavy-duty castors (optional extra, order Model No. STBWK). 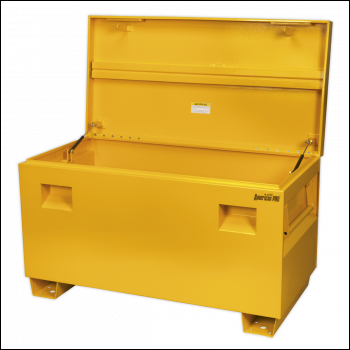 Suitable for secure storage of tools and heavy equipment on site, vehicle, in the workshop or at home. Manufactured from heavy gauge steel with seam welded joints. Folded lips add strength and rigidity. Box may be secured with a padlock hidden in recess at the front. Tamper-proof locking system protects padlock for extra security. Features industrial strength handles on each side of box for manoeuvrability. Lid features gas support strut(s) for easy opening. Fitted with welded feet allowing unit to be moved by forklift. Feet have pre-drilled holes for the option of securing in one place or for easy attachment of four heavy-duty castors (optional extra Model No. STBWK). 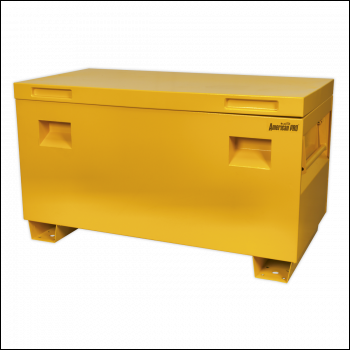 Suitable for secure storage of tools and heavy equipment on site, vehicle, in the workshop or at home.